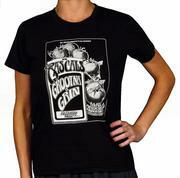 Our women's The Rascals t-shirts feature rock, jazz and blues concert poster designs and are made using the finest combed ringspun cotton to give you the softest, smoothest t-shirt around. Designed to be more tailored to fit your curves, our women's shirts tend to have a smaller cut with shorter sleeves and neck to waist measurements. Be sure to check out our sizing chart to help assure that you'll get the perfect fit on the first try. For a more giving fit, try our Men's Small or Medium sizes.